Arena Racing League® is a SPEC series. All cars must meet league specifications and must be issued by the League. 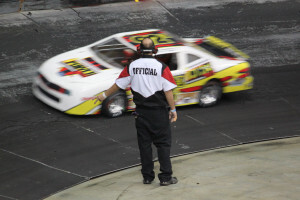 Drivers, owners and crew members must be licensed ArenaRacingUSA® members in good standing. Drivers must be at least 14 years of age to compete in the Pro Class, unless approved by the parents and race director. Teams are allowed to customize only set-up related items, such as caster/camber, toe-in, tire stagger, track bar, coil-over springs and shocks, and lead location. Cars are strictly inspected before and after each event. The Arena Racing League season consists of up to 15 individual series events which culminate in a series point’s championship. Each event will feature up to five Main races, and a nightly Top Dog Championship Race. Drivers will qualify for the different mains by qualifying laps that are run during the day of each event. The fastest will start in the A-Main and the next fastest will start in the B-Main. B-Main drivers will strive to get into the A-Main because more points are awarded in the A. Just before the start of the A-Main a fan will draw an inversion pill to determine the starting lineup. This system prevents the fastest cars from starting up front for every race – and adds to the challenge and the education which is the foundation upon which Arena Racing USA was built. For each event, the top 8 finishers in the A-Main and the top 6 finishers in the B-Main will qualify for the Top DogFinale, which is the last race of the evening. Each Main race awards points to the finishers with the A-Main winner receiving more points than the B-Main, etc. The point drop is one point per position in each Main which creates a tight points race throughout the season. TheTop Dog race is for bonus points only. At the end of Arena Racing League season, the Points Champion will receive $5,000.00 cash plus other awards. The total Event and Championship awards total over $20,000.00 per season. The flag system is the same as in other forms of racing. The flag that no one wants to see is the black flag. The blue flag with the yellow stripe means faster traffic (the leaders) are coming up behind the trailing cars, and the trailing cars should give them room to pass. When a crash occurs, all drivers involved in the incident must go to the rear of the field. All of the ArenaCar® race cars are equipped identically except for the driver, the set-up and of course the paint scheme. All cars must use 2-way communication with coaches. Every car has a transponder for computer scoring.